JOLIET, Ill. – Like two boxers in the final round of a closely-contested slugfest, Kyle Busch and Kyle Larson traded hard shots on the last lap of Sunday’s Overton’s 400 at Chicagoland Speedway. Moments later, it was Kyle Busch who was still standing—with his car parked on the finish line and his fifth Monster Energy NASCAR Cup Series victory of the season in his pocket. In the closing three laps, Larson gained on Busch, who had led from a restart on Lap 213 of 267. Busch was slowed by lapped traffic, and Larson had a strong run into Turns 1 and 2 on the final lap. Larson drove hard into the corner but couldn’t clear Busch’s No. 18 Joe Gibbs Racing Toyota Camry off Turn 2. Larson tapped the left rear of Busch’s car, knocking him into the outside wall. Larson passed Busch on the backstretch, but the 2015 series champion wasn’t finished. Busch got back to the bumper of Larson’s No. 42 Chip Ganassi Racing Chevrolet Camaro ZL1 in Turn 3 and sent him spinning with a hard shot to the rear of the car. 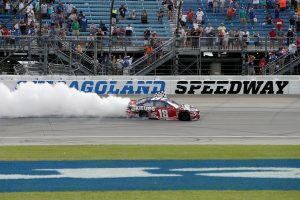 With his second victory at Chicagoland, Busch earned the 48th victory of his career, tied with Herb Thomas for 14th all-time and one win behind three-time champion Tony Stewart. Busch tied Harvick for the most victories in the series this season, marking only the fourth time in series history that two drivers have each won five times in the first 17 races. Martin Truex Jr. finished fourth but failed to lead a lap. Clint Bowyer recovered from three extra trips down pit road because of penalties to run fifth. Erik Jones, Denny Hamlin, Joey Logano, Brad Keselowski and Alex Bowman completed the top 10.